We get excited about March round here, because it brings daytime temperatures above freezing with some consistency. Some of the snow starts to melt out in the valley, but snowstorms are still a very real possibility and we can add much needed water to our snowpack. Fishing really starts to pick up due to warmer temperatures. 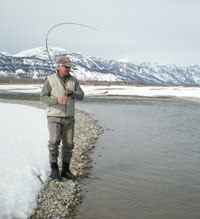 It doesn’t take but a couple of degrees to get our Cutthroat into a feeding mood, possibly even off the surface. Dry fly fishing is more realistic towards the end of the month with Small Black and Brown Stones, and Midges being the meals of choice on the Snake River. The South Fork of the Snake in Idaho begins to fish in March as well, typically below the Canyon near Heise or right below Palisades Dam. Nymphing is definitely the way to go in deeper runs just below any riffle, but you might see a few trout rising to Midges in shallow flats or back eddies. Wade fishing is the norm, but in warmer years, such as 2012 and 2013, we can float these rivers in March, which gives great access to a variety of fishing spots. This greatly increases the chances of finding rising trout and it’s pretty serene floating an empty river!